"A fabulous week of singing, eating, laughing, sight seeing and excellent company"
We are very fortunate to have a loyal following of good tenors and basses but, as we grow and tackle more ambitious music, we need more. So we have had an idea.. If you know a good tenor or bass who isn't already on our Mailing List, why not invite them to get in touch? They will benefit from a £100 introductory discount when they sign up for the first Run by Singers event. And just to be fair to the person doing the introduction (the Introducer) you will get a £100 voucher too. Of course we all expect that once the new singers have experienced how good our singing holidays are, they will be back for more. Terms and Conditions apply, as you might expect. 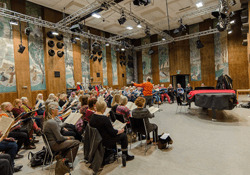 New tenors and basses should be regularly singing in an established choir or choral society. A reasonable standard of musicianship and singing ability is required so please choose carefully. I'm sure you know the kind of singer we are after. Availability will be limited and will vary from course to course. Lady tenors will be considered if they have been singing tenor in their own choir for at least a year and are comfortable reading from the bass clef. Just write to us recommending a tenor or bass who hasn't been on a Runby trip before. As soon as they have paid their final invoice - which will be discounted by £100- you will be sent a £100 voucher valid for one year. You don't have to attend the same course as the person you introduce. Introducers should be people who have already attended at least one Runby course themselves. Will anyone I introduce be eligible? Most singers who are singing regularly should be eligible. If there are already several 'introduced' tenors and basses on a particular course we may have to ask the singer to use their discount for another course. Send an email to info@runbysingers.org. We will answer you as quickly as we can.